Samuel Epes was a promising young lawyer and politician who died of consumption in 1760. His mother married Harvard President Edward Holyoke after the death of Samuel's father in 1741, when Samuel was eight years old. 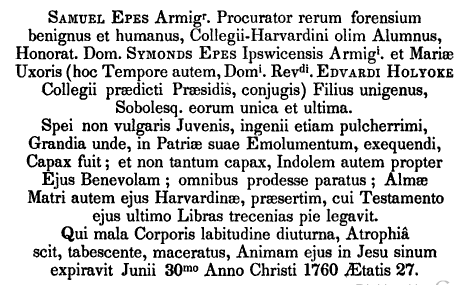 Holyoke considered Samuel a son — his diary contains entries such as "August 20  Sons John Holyoke and Samuel Epes first attended school in Boston." I have not been able to find a translation online. My high school Latin is rusty, but this also looks like another way to say died: "Animam sjus in Jesu sinum expiravit." That must be something along the lines of "His soul expired in Jesus." Sinus means a curve or fold, so maybe something like Jesus' embrace? Does maceratus mean "to chew"? Tabesco means "to waste away," which makes sense because he died of consumption, but "to chew" seems a little graphic. Interesting, and a really magnificent carving job. There's a stone all in Latin in the Common Burying Ground in Newport for a Scot named Menzies. I think I posted a shot of it sometime last year; I'll have to go back and look. I believe Mr. Menzies was also a lawyer; I'm wondering if these Latin inscriptions were the mark of either (a) a law degree or (b) the bragging of a man educated above the level of the surrounding community. It would be interesting to look into that. Macero, macerare, maceravi, maceratus is to soak, tenderize, soften, weaken, wear down, worry, annoy, or torment. If he died of consumption, he probably did die weakened and worn down. I'd avoid tormented and annoyed as word choices. :) Tabescente et maceratus, weakened and wasting away. Sinus can also specifically mean a fold of the toga about the breast, and thereby the bosom or lap. So "in to Jesus's embrace" is a good English translation. "In sinu meo est" as a phrase means "he or she is dear to me," "so-and-so is in my breast/bosom/heart." So you could say "dear to the heart of Jesus" too. (Wags are calling it, "I came, I saw, I mangled.") But it actually did a remarkable job with Animam ejus in Jesu sinum expiravit: "His soul in the bosom of Jesus gave up the ghost." For "macerate" I think I'd read "consume." Who's the carver on this one? Thanks for all of the great Latin help! This is a Lamson shop stone – one of their more elaborate models, not the ubiquitous lightbulb-shaped skull pattern. I looked up the Newport stone - it's for Jacob Menzies, spelled Jacobus Meinzeis on the stone, but since it's pointed out on the stone that he was Scoto Britannus, and knowing that Menzies is a common Scots surname, I made concessions to 18th Century approaches to spelling and identified the gentleman. His epitaph pegs him as an educated man, but I guess I was wrong about his being a lawyer; no mention of that on the stone. This is a very fine example of the work of Joseph Lamson II (1728-1789), son of Nathaniel (1692-1755), grandson of Joseph I (1658-1722).